LocationSoutheast 7th Avenue, Delray Beach, Florida. 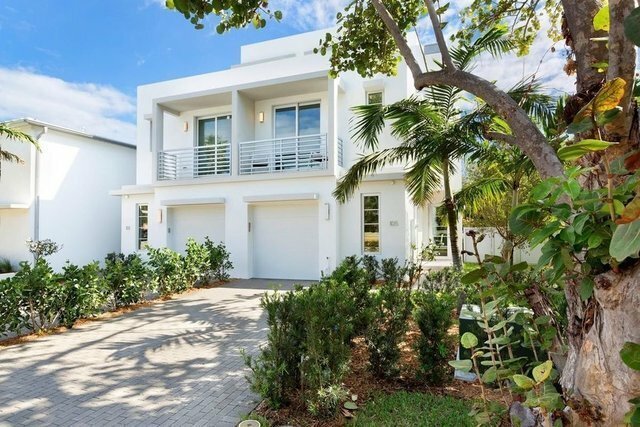 In the trend-setting Marina District neighborhood, this quiet location is only a block from vibrant Atlantic Avenue, the downtown centerpiece of this charming village-by-the-sea - famous for its wonderful shopping, dining, and entertainment - with the ocean's sugar sands also within walking distance.PropertyJust completed in 2018, these two exquisite contemporary townhomes were created by Seaside Builders, a well-respected Delray Beach firm, in collaboration with innovative architect Richard Jones. Crisp clean lines, airy spans of glass, and an open floor-plan are signature elements of the South Florida modern design set off by fine finishes that complement the inviting coastal feel. In the beautifully landscaped setting, each residence opens to its own tranquil outdoor retreat featuring a private plunge pool surrounded by a walled garden terrace.ResidenceEach effortlessly designed floor-plan has three bedrooms, four and a-half baths, and an attached garage in the total of 3,426 /- square feet. European oak floors ground the freshly refined living environment which also features a glass-framed loft-inspired staircase, sleek custom-crafted cabinetry, and impact-resistant PGT WinGuard windows and exterior doors.Bringing the outdoors in, the capacious great room opens to the pool terrace from this versatile living/dining space which is combined with the chef's kitchen, done in soft tone-on-tone hues, featuring quartz counters, Jenn-Air appliances, and a waterfall-edge island/bar. On the second floor, the luxe master suite opens to a treetop balcony facing the Intracoastal Waterway, and features two customized walk-in closets plus a spa-like bath with glassed shower. The other wing contains two bedroom suites, one with a sunset balcony. Opening to a wraparound balcony facing the Intracoastal, the third-floor's recreation room is perfect for private relaxation or entertaining, complete with a wet bar and full bath.